Did you check out the eBook I announced yesterday? You can read about it here. It's a travel book of some of my favorite shots, and it's free! 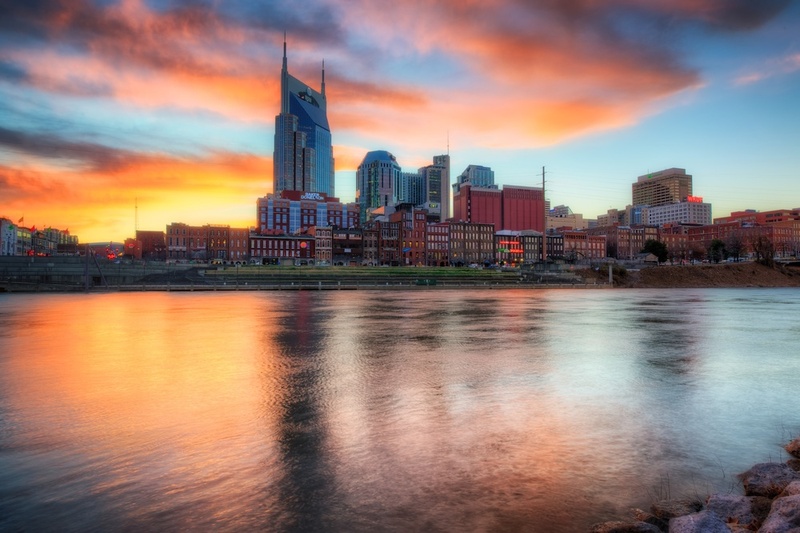 Here’s another view of the Nashville skyline from my shooting there last week. The first shot I posted the other day was taken a little bit earlier, sort of during golden hour. This shot was taken during a full-on sunset. It was a color extravaganza! I was very happy with how this evening unfolded. It just goes to show you that you can never accurately predict what sort of light you will get. The entire morning and afternoon there was a boring sky...no real clouds, and not much sunshine. I assumed it would be a boring sunset. But late in the afternoon these clouds started appearing, and I was hoping that they would stick around during sunset. They did...and then the light hit them just right!